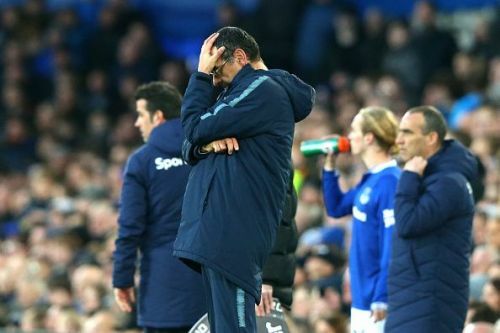 Chelsea manager Maurizio Sarri defended his side's performance in today's 0-2 loss to Everton in a post-match press conference, claiming his side played well yet failed to capitalize on chances. We played probably the best 45 minutes of the season and then suddenly at the beginning of the second half we stopped to play, without defending so we were in trouble. You have to take your chances, we had six or seven opportunities. We had only to score. First of all we needed to stay into the match. Everton had failed to beat a side in the top 6 since January 2017, when Ronald Koeman was the club's manager. But after 25 matches against the top 6, they finally ended their drought, defeating Chelsea with goals from Richarlison and Gylfi Sigurdsson. This defeat comes as a devastating blow to Chelsea's chances of finishing in the top four and playing in the Champions League next season. With 57 points, they sit three points off Arsenal, who are in 4th place. Chelsea must play Manchester United and Liverpool, as well as tricky fixtures against Watford and West Ham. They will also face Burnley, Leicester City, and Cardiff City, but their most feasible route to qualification for next season's Champions League lies in international competition. Chelsea face Czech side Slavia Praha in the Europa League quarterfinals, and if they beat them, they will face either Benfica or Eintracht Frankfurt in the semifinals. On the other side of the bracket, they could face Arsenal, Napoli, Villarreal, or Valencia if they are to advance to the Europa League Final. Chelsea are playing in the Europa League for the first time since 2012/13, when they were knocked out by Juventus and Shakhtar Donetsk in the Champions League group stage, before defeating Benfica in the final.